Oil Filler Cap, Gap to Bonnet, and Improving Breathing ? #1 Oil Filler Cap, Gap to Bonnet, and Improving Breathing ? 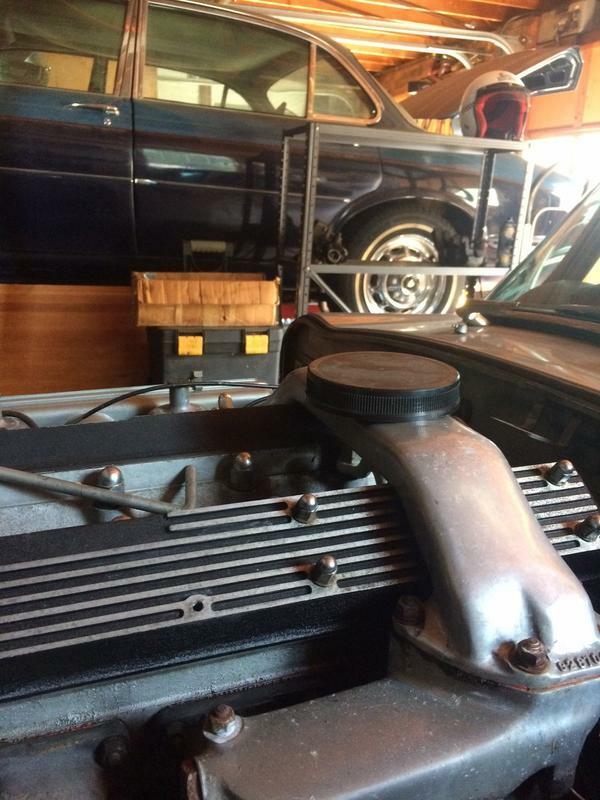 Would some kind souls measure how much room there is above the top of their oil filler orifice and the bonnet ? The Monza cap sits 33mm above its base, against my original cap's 15mm. My personal interest is in the 3.8 but dimensions from later models would be welcome too. Last edited by rfs1957 on Thu Sep 20, 2018 4:00 pm, edited 1 time in total. 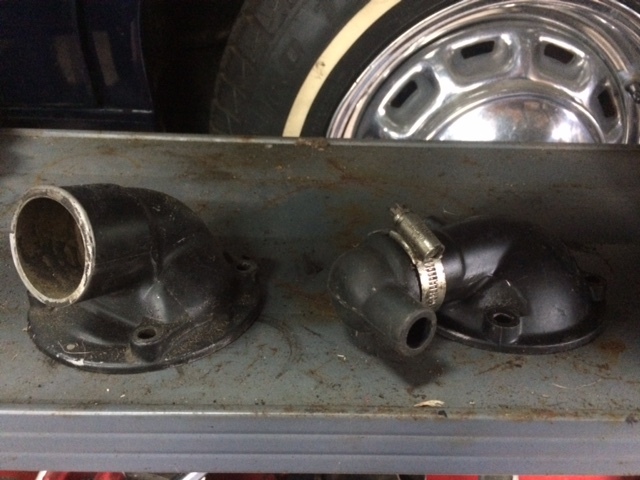 #2 Re: Oil Filler Cap - and gap to bonnet ? I know he did the same thing to his and if you haven’t already seen it. I know when I spoke to him there weren’t any clearance issues. I’d measure mine for you but the bonnet is off the car. #3 Re: Oil Filler Cap - and gap to bonnet ? #4 Re: Oil Filler Cap - and gap to bonnet ? 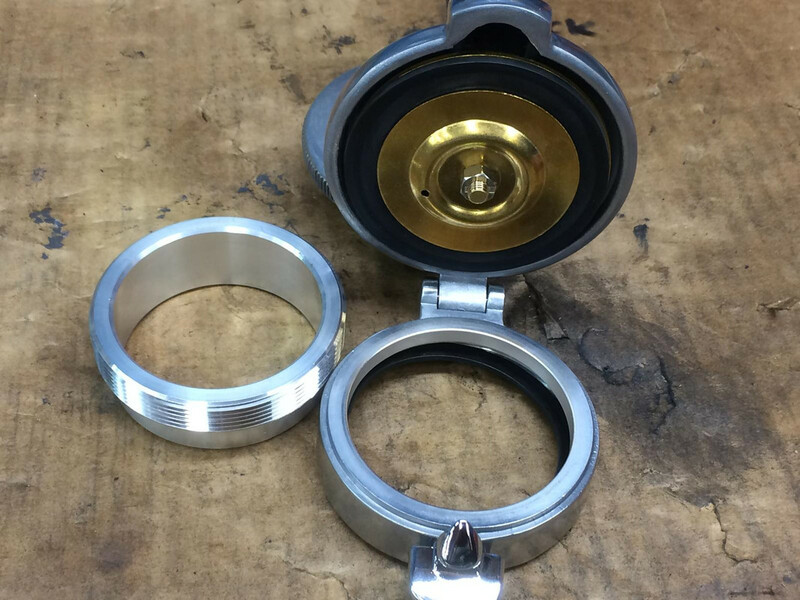 Sorry for asking, , what are the advantages of fitting such a cap? #5 Re: Oil Filler Cap - and gap to bonnet ? You can't absentmindedly lose the cap. You only need to press quickly to release, not unscrew a hot cap at a petrol station. #6 Re: Oil Filler Cap - and gap to bonnet ? #7 Re: Oil Filler Cap - and gap to bonnet ? It's a justification for owning a lathe. #8 Re: Oil Filler Cap - and gap to bonnet ? Peter, can you put a picture or two of the D type breathers up ? 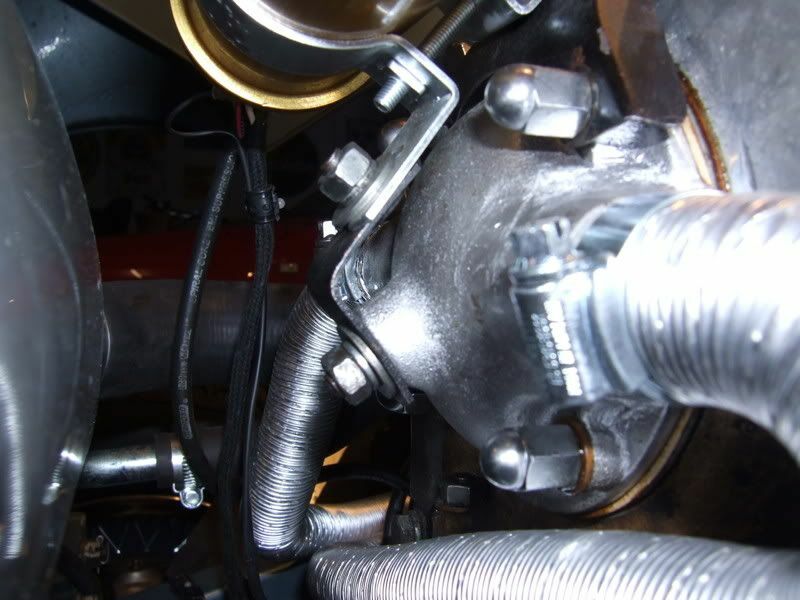 What source or adaptable part is good for similar period-credible hose adaptation stroke union for adding additional breather pipes, and who thinks this is anyway unnecessary and a waste of time ? 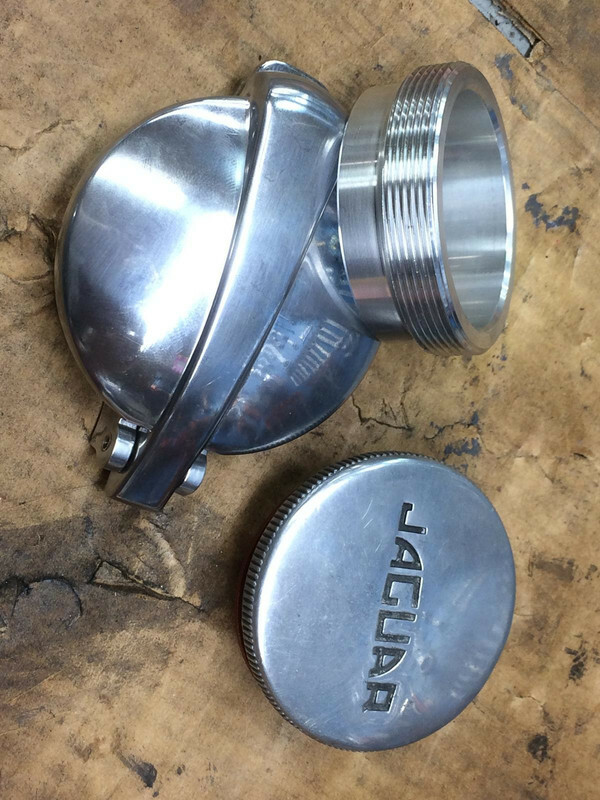 #9 Re: Oil Filler Cap - and gap to bonnet ? Here's the real McCoy - GBP500 each inc VAT https://www.bighealey.co.uk/jaguar/jagu ... aight-port. Plus 180 incl for the flanges/tubes. About 1200 anyhow. You can't have too much breather unless you want to establish crankcase vacuum or meet emissions, but 1100-1200 squid is a lot of money to save small pumping losses. On a big single or 360-degree parallel twin or boxer (and some V-twins) these losses are significant. On a 180 degree twin or multi-cylinder, less so. Still, it looks 'racey' and Jag used this system on all Ds and Lightweight Es. Some people even think it means a wide-angle head and who am I to pop their balloon? I had half a dozen twin-breather towers for the left cover cast using a pattern not shown and the transverse breather tubes/flanges cast using the red wooden one. This has the cover flange boss that welds to the cover cast integral with the tube and flange that's bolt to it. This was to ensure perfect alignment when drilling breather and fastener holes, prior to sawing into two parts at the point where the flange meets the boss. Sadly (but harmlessly) the cut was made by the foundry at the 'wrong' place, leaving a bit of boss on the flange but this will be trimmed off. The twin breather tower has two standard tube size pipes protruding (7/8"/nominal 22mm), which are very snug fit and angle back with convoluted alloy/paper breather tube attached, for that 'works team' look . 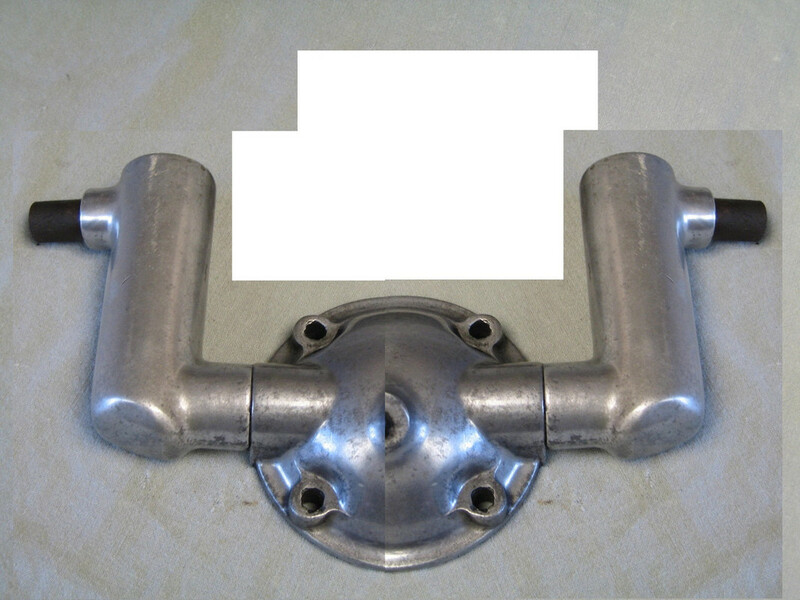 The pipes have a 120-degree kink and can be rotated to fold close to the cover, before holding firm with gasket goo. You can just use short tumps of straight pipe and let the breather tube take the bend. 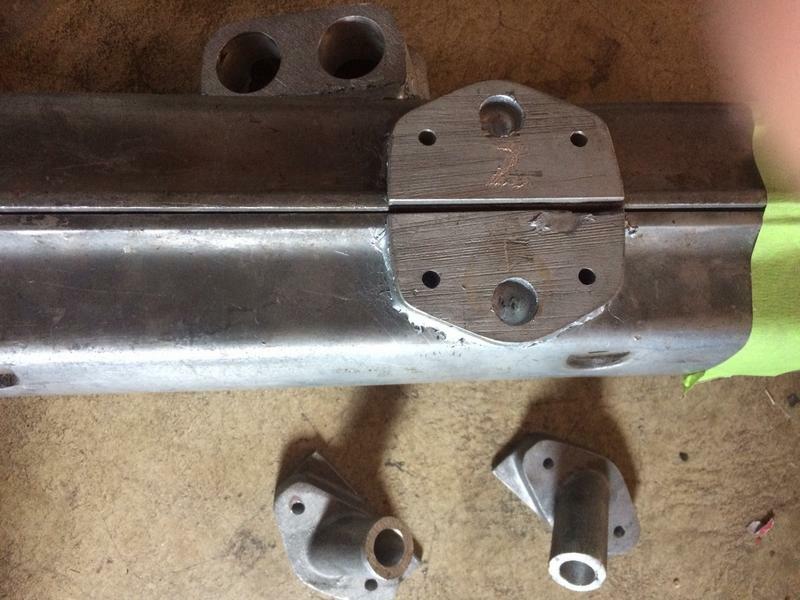 The transverse tubes and flanges can be made of tube and sheet metal, which is more original or you can buy from Denis Welch and align the holes yourself. 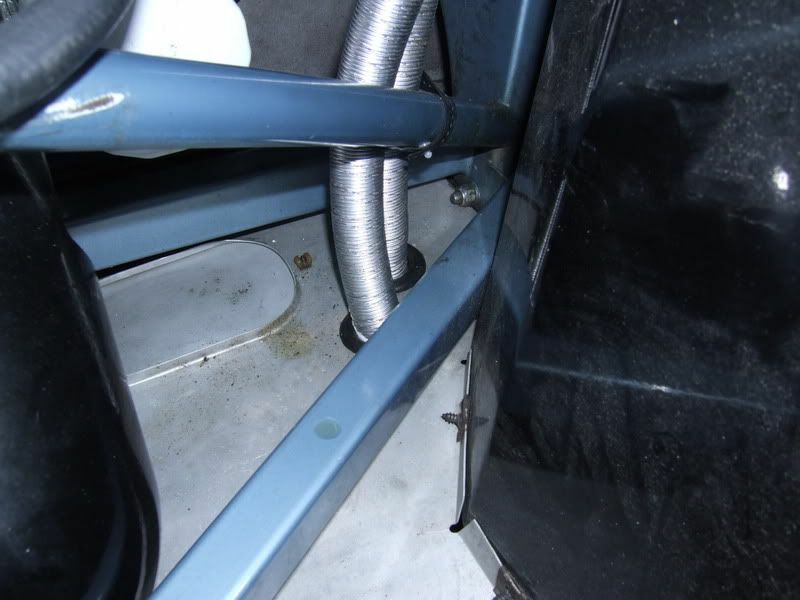 The transverse connection here is oil-proof rubber hose, not alloy breather tube. 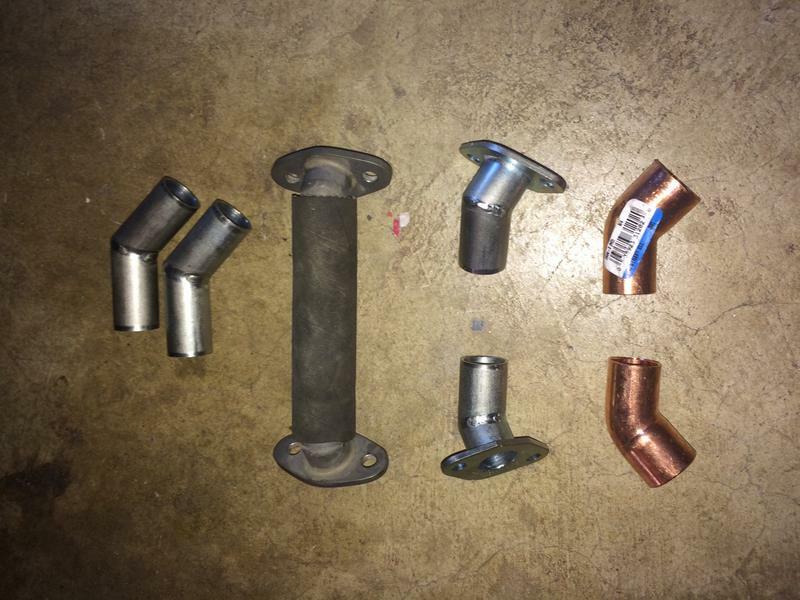 The picture shows left to right: steel tower tubes before trimming, the 'works' transverse fittings and hose, fabricated steel transverse fittings/flanges and 120 degree brass plumbing fittings that could be soldered to a flange or used as breather tower tubes once slipped over a short copper stump into the tower. The standard S1 breather has a 0.5" ID. These conversions more than triple that with 2x 0.8"
The final picture shows my S2 with its crossover, to demonstrate clearance for the tower. Even with the black lid in place the bonnet still shut, so although my engine mountings are due for renewal, you can see the clearance where the tower would be. Finally, for those who have asked, here's a very fuzzy picture from the shipper (CARS, nr. 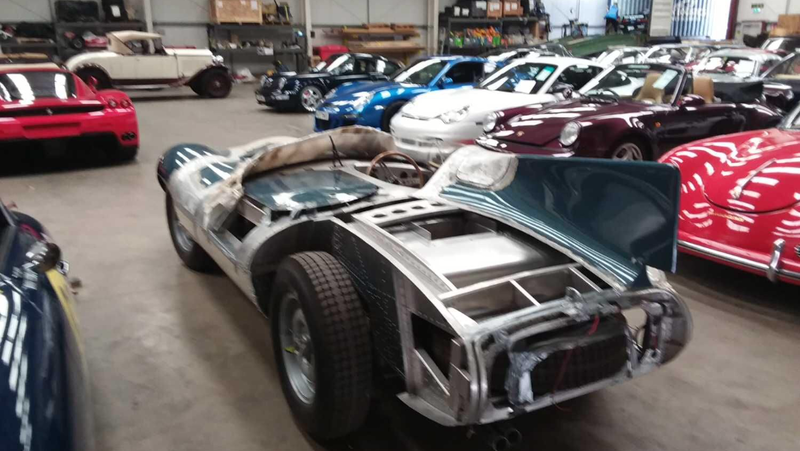 Bury St Edmunds) of the D-type slung together for shipping, pending disassembly, final riveting and rear skinning/painting/completing. To recoup my outlay a bit, I will sell the three spare breather towers, each with enough tube and 2x brass 120-degree fittings to make the two breather pipes. The Denis Welch tube set that cost me about 180 inclusive, would sell for the VAT-free price. If we have a lister with foundry connections, they could use the wooden transverse pattern to cast more, and turn a spare tower into a pattern to make more of those. Contact me off list, I suppose. #10 Re: Oil Filler Cap - and gap to bonnet ? and who thinks this is anyway unnecessary and a waste of time ? Difficult item to photograph as it sits behind the header tank. Mine came from CMC. Worthwhile if you have a high performance engine and 'open' trumpets. #11 Re: Oil Filler Cap - and gap to bonnet ? Thanks for going to such lengths, Peter, and for your suggestion, David. One is tempted to conclude, as this post began with the filler-cap, that it is the filler-cap orifice that might actually constitute the ideal spot to incorporate extra ventilation ....... maybe cam-spray precludes that location. 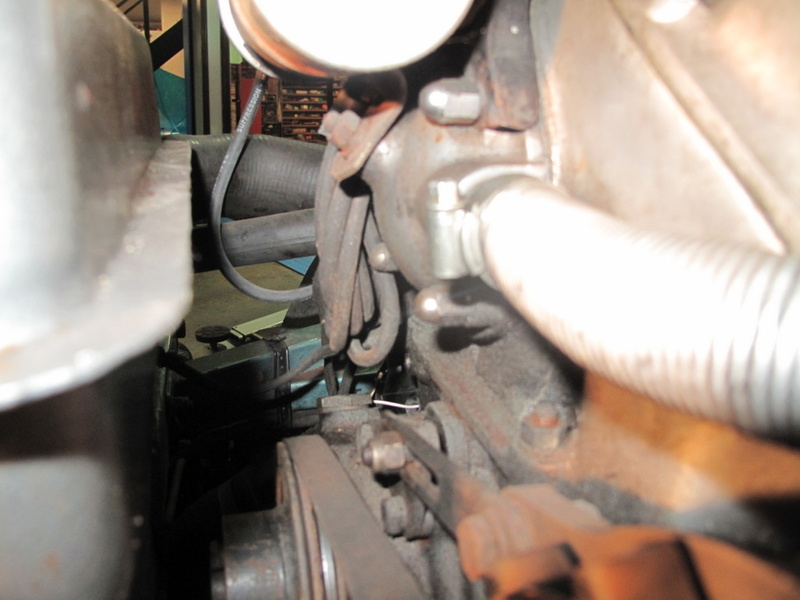 As to rope-seal failure being caused by crankcase-breather issues, is this speculation or established ? 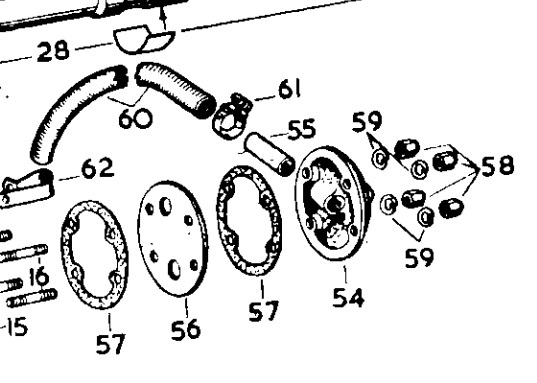 My own experience examining single-cylinders (the worst case ?) 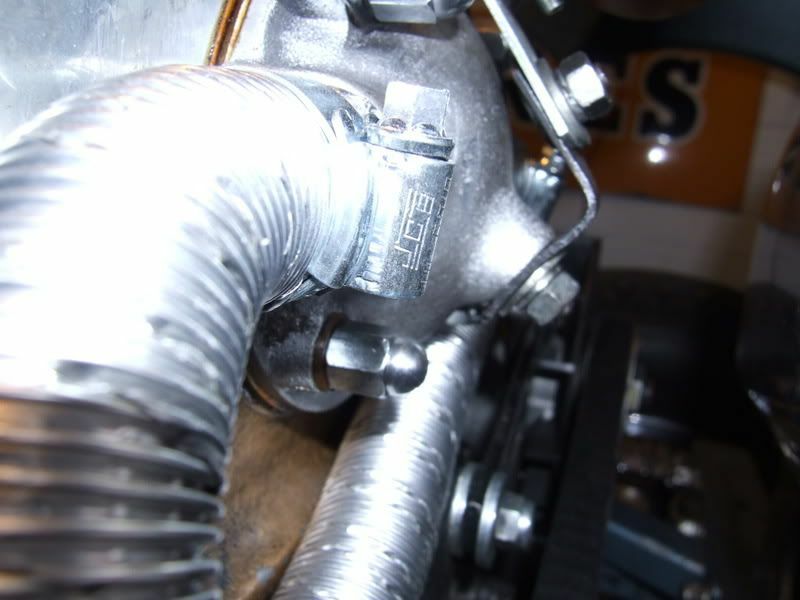 and vee-twins on a dyno was always that their breathers were remarkably non-wheezy or busy, and that open, closed, or bigger made zero difference to power output. #12 Re: Oil Filler Cap - and gap to bonnet ? It was Andrew Turvey at CMC who diagnosed the rope seal failure after 8,000 miles and concluded it was due to the crankcase pressure generated by my particular engine with 9.5:1 compression and trick cams. He felt the standard vent was of insufficient diameter and could become blocked (and I assume this is your thinking). They developed the dual outlet breather specifically for high performance and race engines so suggested that I fit one. They were only £50 each plus the cost of the corrugated tubes so not exactly a cynical marketing ploy! As to total sample size I have no idea but CMC thought it worth making the mould and getting the castings made so there must have been quite a few cars affected. I have since covered 40,000 miles with no further problem. Not sure if CMC still offer the dual outlet breather but someone with your experience/skills could fabricate one and test it out. 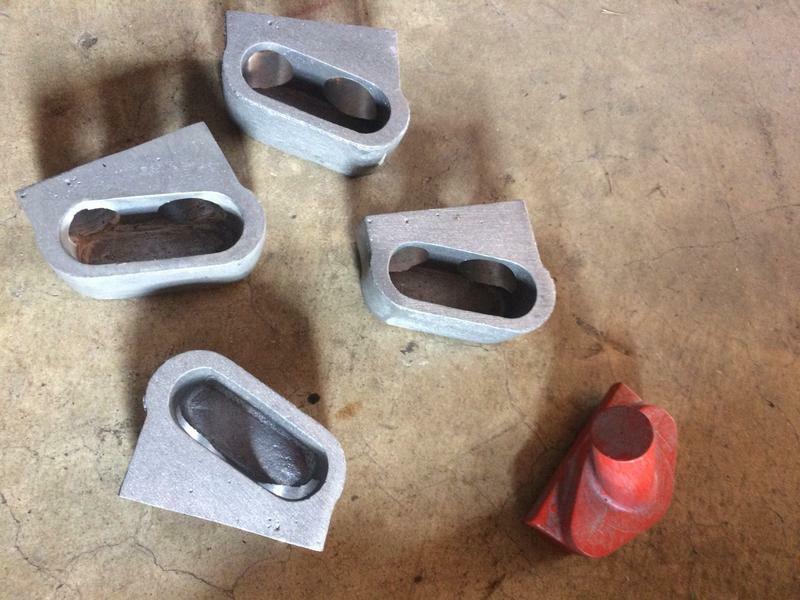 A lot easier than buggering about with machining cam covers. If the mod is insufficient for your needs you could always then move over to the faux D-Type eye-candy system. About the only thing I would do differently is to add an alloy oil catch tank for the sake of the environment (obviously) but also to track how much oil is being exhausted. #13 Re: Oil Filler Cap, Gap to Bonnet, and Improving Breathing ? CMC don't have any of these any more but are interested in having another go. I really like the decanter-tower type that's fitted to mine, and wondered if it wouldn't be possible to modify a breather casting (or make another ?) that would actually carry a pair of these ? See my dreadful Paint-Chopped and flipped picture. Is this total nonsense, in that it would be phyiscally impossible to fit for reasons of space, routing etc ? I can't judge as everything's in a million bits. 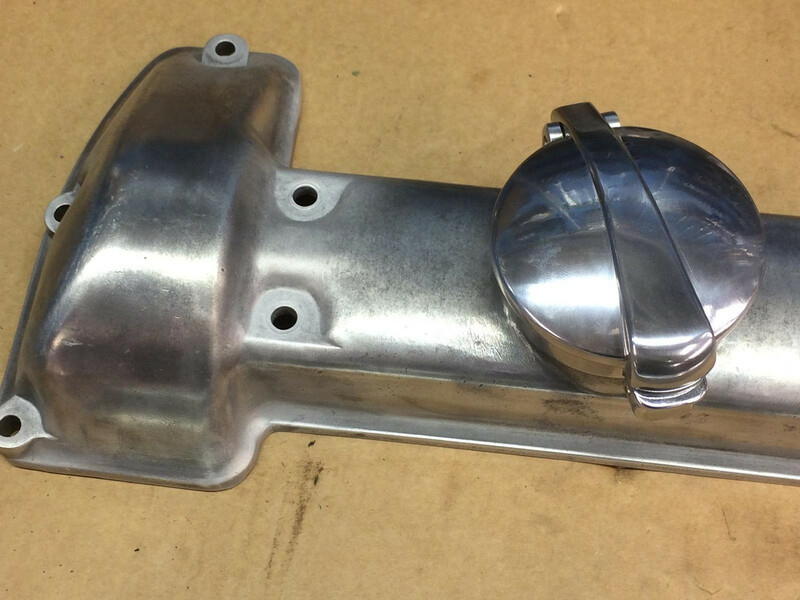 #14 Re: Oil Filler Cap, Gap to Bonnet, and Improving Breathing ? Don't see the need for the oil traps, they are only going to get gummed up. Just run two pipes straight out - simple and clean. The original gauze (or baffle on the first 500 cars) is still there to trap and return as much oil as possible to the circulation. #15 Re: Oil Filler Cap, Gap to Bonnet, and Improving Breathing ? FWIW Rory, that device would be better than stock, but present a total of 264 mm2 X-sectional area, versus the 314 mm2 that is the ID of the main breather tube from the cover. So if you are concerned about back pressure alone, just wind the alloy baffle off the base steel stump and fix a 1" hose to that. #16 Re: Oil Filler Cap, Gap to Bonnet, and Improving Breathing ? Only a thought. What about the larger XJ6 S3 breather? Rather than keeping it black you could polish it. I might even have one I can post to you to experiment with. You could still fabricate some alloy tubing and polish it to replicate the look of the original but just a larger bore? Back to the filler cap area I suspect splash might be a problem as Darren did initially develop a leak from the actual cap seal not the adapter sleeve. I think he replaced or modified the seal . #17 Re: Oil Filler Cap, Gap to Bonnet, and Improving Breathing ? "What about the larger XJ6 S3 breather? Rather than keeping it black you could polish it. I might even have one I can post to you to experiment with. 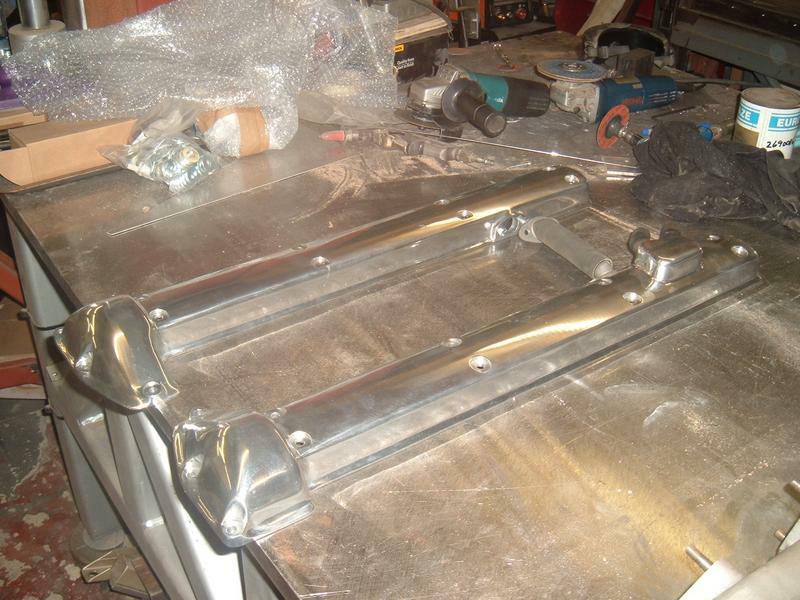 You could still fabricate some alloy tubing and polish it to replicate the look of the original but just a larger bore?" #18 Re: Oil Filler Cap, Gap to Bonnet, and Improving Breathing ? 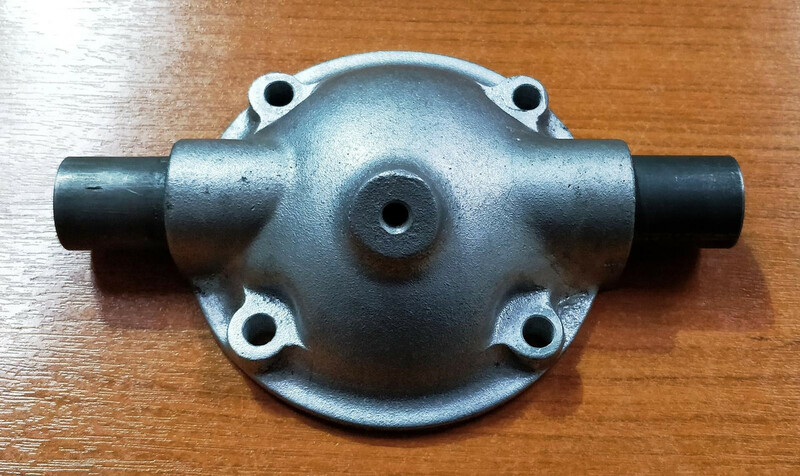 This is the CMC part, available for £78 inc VAT. Might have been tempted if it had been polished .......... but it can wait for now. #19 Re: Oil Filler Cap, Gap to Bonnet, and Improving Breathing ? 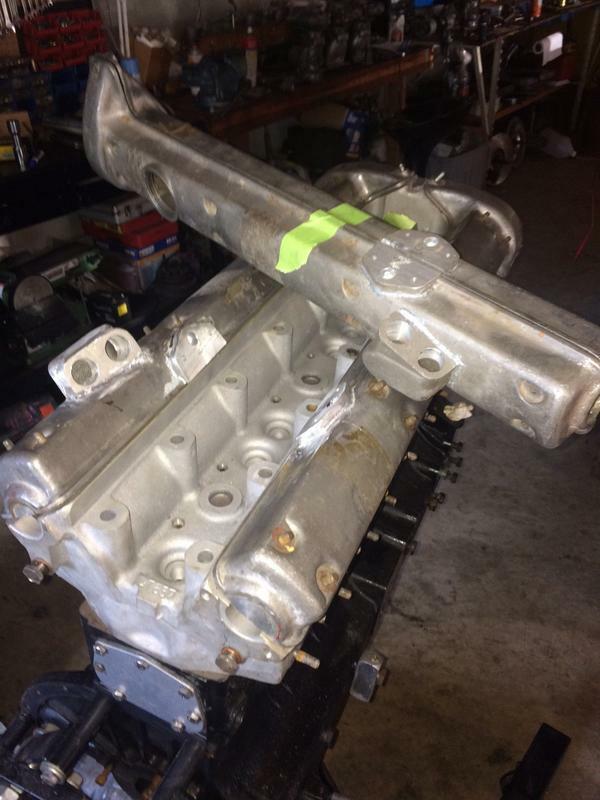 Could anyone advise where I could purchase the dual engine breather from please. Contact details would be great. 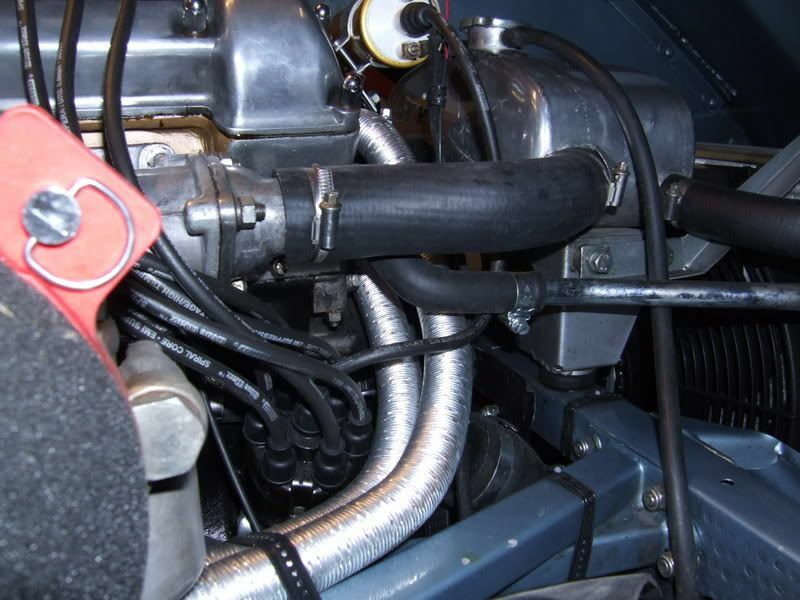 #20 Re: Oil Filler Cap, Gap to Bonnet, and Improving Breathing ?